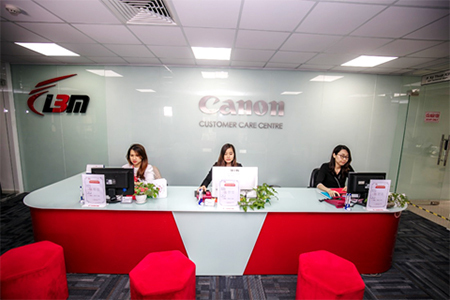 Ho Chi Minh City, 27 March 2018 – With a 16 year history of growth and development in Vietnam, Canon Marketing Vietnam and its Distributor of over two decades, Le Bao Minh have teamed up and unveiled their massive new Canon Repair and Warranty Center in Ho Chi Minh City. Located within the Le Bao Minh Building at 184 Nam Ky Khoi Nghia Street in Distict 3, the new opening underscores Canon's commitment to excellence in products and service to its customers in Vietnam. Spanning over 700m², the Canon Repair and Warranty Center has been built to Canon's exacting regional standards, and built under the close scrutiny of the company's headquarters. 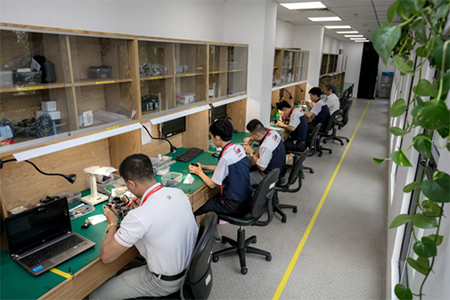 The camera maintenance area represents a US$2 million investment into Vietnam, with all systems, equipment, design and installation prepared, maintained and executed to the identical standards a similar facilities in Singapore, Thailand, Malaysia, Philippines, Taiwan, Hong Kong, Indonesia and other nations around the region. This systemic approach to after-sales service extends into human resournces, equipment, technology, process of receiving, inspection, repair, component replacement and electronic & mechanical calibration. The facility offers three main areas - Camera, Printer, and Photocopier. The 250m² Camera area features precision machinery designed to work on the sophisticated technology that can be found inside every Canon camera. With a range of equipment specially imported from Canon's Regional Office, the closed-process lab-like environment is temperature and light controlled, and includes an extremely high standard of air purification. *In 2015, 91% of warrantied products were returned to customers within 3 working days (from the receiving date). This had increased to 92% in 2017. The company's rate of returns on repaired products dropped from 1% to 0.1% over the same period. Wait times on imported components has remained the same at 2%. Each of Canon and Le Bao Minh's 90 technicians has undertaken proper training, and is certified for each line and product group. Their performances are monitored through Canon's global assessment system, with each technician evaluated and tested annually in terms of their skill and product knowledge, as well as the use of the maintenance equipment. In addition, the Center also has a CALL CENTER at 1900 55 8809 to receive, process, answer inquiries from customers about products, prices, promotions and warranties of Canon. Canon Marketing Vietnam's General Director, Mr. Hiroshi Yokota said of the market: "Vietnam is still a nation of opportunity for us. Investing in an international standard Service Center for repairs reiterates to customers our commitment to quality and service and the long term view we hold for them here." Le Bao Minh Representative, Mr. Nguyen Manh Bao, added: "While there may be many retailers offering maintenance services, none have made the same level of investment in after-sales care as we have here. The investment in this grade of sophisticated technology to ensure the best possible handling and repairs of our customer's products. To us, 'warranty' does not just mean 'problem solved' - it means that the product is returned to the customer in the best possible condition. We are looking to provide a similar facility in Danang in future, as well as setting up transfer stations along the country so that people in other provinces can have their products transferred to the nearest center for repair in Hanoi, HCMC in the fastest possible time." Currently, Canon Repair and Warranty Center is running free product checking policy and providing 3-month-warranty for components which are replaced by Le Bao Minh. Canon is a global leader in photographic and digital imaging solutions. Canon Singapore Pte. Ltd. is the headquarters for South & Southeast Asia driving sales, marketing and service strategies. Besides handling the domestic market, the company leads 18 other countries including subsidiaries in India, Malaysia, Thailand and Vietnam. The parent company Canon Inc has a global network of close to 300 companies and employs close to 200,000 people worldwide. It is dedicated to the advancement in technology and innovation and commits more than 8% of its total revenue each year to R&D. Canon is consistently one of the top few companies to earn the most number of patents over the last 20 years. As a Fortune Global 500 company, Canon is guided by its kyosei philosophy that focuses on living and working together for the common good. Canon products have been available in Vietnam since the 1980s through its authorized distributors. In the last twelve years, it established a more significant presence when it set up three production facilities in Thang Long, Hanoi, Que Vo and Tien Son, Bac Ninh and Canon Marketing Vietnam Co. Ltd. Besides providing employment for more than 25,000 people, Canon also makes outstanding contributions to the country's development through its meaningful social activities. Canon Marketing Vietnam Co. Ltd operates under the guidance and support of Canon Asia Marketing Group and Canon Singapore Pte. Ltd., which is the regional marketing headquarter for Canon's South & Southeast Asia region. Along with the distributor Le Bao Minh, Canon has more than 300 authorized service partners in the country. For more information, please visit: www.canon.com.vn.